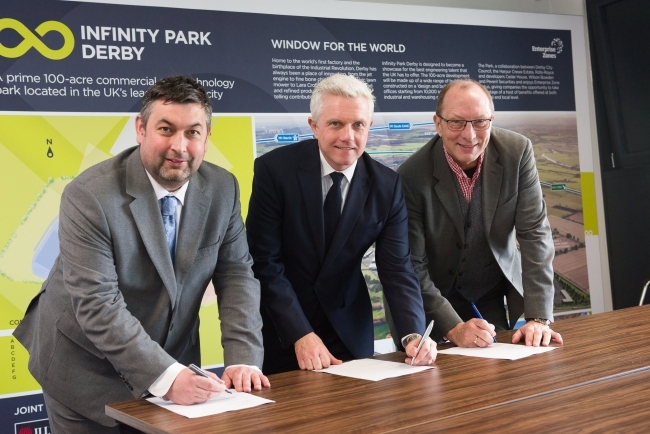 A collaboration agreement has been signed between Derby City Council, the D2N2 Local Enterprise Partnership and one of the world’s leading manufacturing research institutions to establish a new multi-million pound innovation facility at Infinity Park, the 100-acre manufacturing-focused commercial and technology site. Proposals have been approved to enable the University of Sheffield Advanced Manufacturing Research Centres (AMRC) to establish a new 50,000 ft2 base on Infinity Park. AMRC was established by the University of Sheffield in 2001 on the Advanced Manufacturing Park in Rotherham and has developed into a cluster of innovation centres focusing on the UK’s key engineering industries. It is now home to 600 highly skilled engineers working in partnership with some of the world’s most respected manufacturing brands, including Rolls-Royce, Siemens, Sheffield Forgemasters, Airbus, 3M, Laing O’Rourke, Cammell Laird, BAE Systems, Westinghouse, Sellafield and EDF. AMRC recently helped secure more than £100m in inward investment to the Sheffield City region from Boeing, Rolls-Royce and McLaren and is looking to replicate its success with the new research centre at Infinity Park, which it hopes will attract firms seeking to develop new technologies to the city. The agreement will support Derby City Council and D2N2’s bold strategy for improving the region’s economic growth, skills and jobs. D2N2 is allocating £12.9million to Infinity from its Local Growth Fund allocation over six years to help improve infrastructure on the site. The new 50,000 ft2 Derby facility will be an extension of the iHub and allow more new technologies to be delivered regionally, bringing with it access to the national High Value Manufacturing ‘Catapult’. Catapults are a network of independent, not-for-profit, UK research centres designed to transform the UK’s capability for innovation in specific areas and drive economic growth. Initially the new AMRC facility will be based in the iHub while the collaboration develops plans for the new building and the activities within it. Andrew Storer, CEO of AMRC’s energy centre, said: “AMRC aims to build a world-class manufacturing base here in the UK. We have succeeded in making the Sheffield City Region a magnet for inward investment. Now, with the support of Derby City Council and D2N2 we hope to have the same impact here at Infinity Park. “The new Derby facility has the potential for cross-sector activities, which we hope will enable us to expand our work into new areas of research. Peter Richardson, Chair of the D2N2 Local Enterprise Partnership, added: “Derbyshire and the wider D2N2 LEP area has a history of and reputation for manufacturing excellence, but we need to look to the future. Greg Jennings, acting director of economic regeneration at Derby City Council, said: “This is fantastic news for Infinity Park and indeed the whole of Derby. Since it was launched 18 months ago, the iHub has succeeded in building on the city’s reputation for creating cutting-edge ideas, particularly in the aerospace, automotive and transport industries.